Thousands demonstrate in Egypt to demand that Ahmed Shafiq be banned from a run-off presidential election. Thousands of people demonstrated in Egypt on Friday, to demand that former President Hosni Mubarak's last Prime Minister, Ahmed Shafiq, be banned from a run-off presidential election. AFP reported that the protesters also denounced verdicts in the trial of Mubarak and his security chiefs, amid reports that the ailing strongmen sentenced to life in prison for the deaths of protesters could be transferred from jail to military hospital. In Cairo's Tahrir Square, the hub of nationwide protests that overthrow Mubarak last year, more than 5,000 protesters denounced Shafiq and the Mubarak verdicts as activists staged a mock trial of the ousted president on a wooden podium. “No to leftovers from the old regime,” read one placard, in an allusion to Shafiq who faces the Muslim Brotherhood's candidate Mohammed Mursi in next week's run-off election. 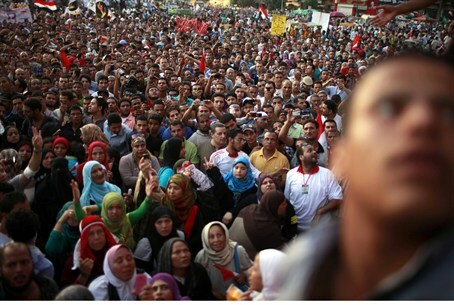 Smaller protests were held in Alexandria on the Mediterranean coast and several other cities, AFP reported. Meanwhile, Shafiq pledged he would uphold freedoms in a press conference. Earlier this week, Shafiq hit hard at the Muslim Brotherhood on Sunday, warning that an Islamist victory will lead to terrorizing Christians and accusing the Brotherhood of trying to make “Palestine" the central issue for Egyptians. The Muslim Brotherhood, which also clinched the majority in recent parliamentary elections, has threatened to cancel the peace treaty with Israel by putting the issue up for a referendum and letting Egyptians decide.